We drove through South America from the north to the south – the most challenging trip ever managed! When we first started, we weren’t sure ourselves if it would be possible, however … where there’s a will, there’s a way! In four months we drove through the whole of South America, from Guyana to the southernmost South American city accessible by car – the radar station Moat at the end of the last road on the continent – in two Trabants, a small Polish Fiat and a Jawa 250, and still managed to get to Buenos Aires. Five Czechs, two Poles and Slovak, 21, 124 kilometers over the most arduous and beautiful terrain that South America can offer. This covers the most direct part. Now, the second phase awaits us – to make a movie, a series and to travel from lecture to lecture – but we love this as much as we do the far journeys. We offer lectures with hundreds of photographs and videos from our three most important journeys – along the Silk Road, Across Africa and through South America. The lecture is approximately one and a half hours long. We’ve been holed up in the editing room since the beginning of July, working on a television series for Czech Television and a film. A series of twelve, one-half hour episodes is the greatest comprehensive traveler’s achievement in many years and the first Czech docu-reality. The film premier and, subsequently, the series are planned for Spring 2014. The team is led by traveler and director, Dan Pribaň. The primary cinematographer was the experienced Zdenek Kratky, who, among other things, shot, for example, the over one-half year long journey of Kate Leeming, who rode through Africa, from east to west on a bicycle. Dana Zlatohlavkova, co-author of the movie Across Africa in a Trabant, headed the second camera and who is now irreplaceable in cutting the vast amount of 480 hours of material that was shot. It all began in 2006, when we had a great idea: we would drive to Africa in a Land Rover! There was just one little problem – we did not have a Land Rover. So we decided to go in a Trabant. Why? Because we didn’t have a Land Rover and mainly because they told us it was impossible. We wanted to show that it was possible. And we stuck with it. In 2012 we had another great idea – to take along some crazies from abroad. And so a Polish crew drove along with us with their beloved Fiat 126p, called Maluch, with just 23 horsepower – three less than a Trabant – and the highlight and biggest nut was Slovak Marek Slobodnik on a Jawa 250. And it was a great idea; a whirlwind of stories, problems and unexpected resolutions that a person would never find with a “normal” group. It was worth it! At the beginning of a journey, you never know what awaits you, even if you prepare for it with the greatest care. And South America was worth it. In Brazil, the expedition drove through the most challenging road of the Amazon basin – the officially closed road across the rain forest, the feared BR319. At times it was on the edge or beyond it … In the Peruvian Andes we climbed to an altitude of 4 868 m above sea level – the highest a care with a two-stroke motor has ever gone! When we first climbed above 4 000 meters, we celebrated … and then threw up from altitude sickness. After a few weeks, driving four kilometers above sea level seemed normal and problem-free to us. The expedition nearly ended in its first third! We struck out along a Pacific beach, made a mistake and our cars were almost washed away by the tide and waves. In the end we managed to save the cars. It was, however, the first time in the history of Trabant journeys when the team came close to losing their cars. Speed record on the largest salt plain in the world! In the end, as expected, the speed record was not beaten, but the Trabants got to drive along Salar de Uyuni in the Bolivian desert. It was an unbelievable experience driving across infinity. All proceeds from the sales of films go to support our next great, and, for now, secret, project (we promise it’ll be worth it) and also, like always, to finish paying off our debts from the last journey. Sit behind the wheel of the only Trabant that has driven across four continents.  A virtual tour of the Expedition Trabant Egu. Would you be able to stand four months traveling through the wild in this box? home Copyright © 2012-2013 | Created by Massimo Filippi, s.r.o.